In the top story on Columbus, Georgia, TV station WLTZ this morning, Auburn United Methodist Church members talked about their experience of working with the Fuller Center Disaster ReBuilders in New Bern, North Carolina, where they teamed up with friends from New York’s Orchard Park Presbyterian to help families affected by Hurricane Florence. The groups also teamed up last year to work with the Disaster ReBuilders in east Texas. Below, Auburn UMC’s Justin Murphy, Bob Money and Sharon Roby talk about the experience with the hosts of WLTZ’s “First News.” The Fuller Center would like to thank Auburn UMC for its focus on putting faith into action. 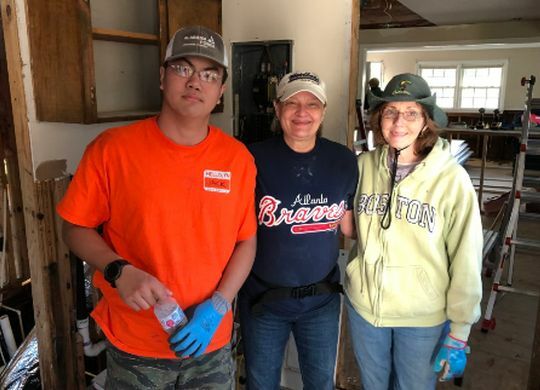 If you would like to learn more about volunteering with the Disaster ReBuilders in North Carolina or Texas, click here.